The delights of holidaying in the Cotswolds are many and varied including beautiful scenic and quiet countryside, honey-coloured mellow stone buildings melting into the surroundings, gentle warm personalities of the local people, castles and 1000 year old cathedrals and churches. However, beneath the permanence and solidity, the forever exterior, is an idiosyncrasy borne out of the ancient traditions of the past centuries. Here are some strange things and curiosities that if you get the chance to witness at firsthand whilst on your vacation it will certainly give you something to remember and talk about for an eternity. WHAT HAPPENS - Teams of four run in relays carrying a 60lb woolsack (35lb for the ladies) up and down Gumstool Hill, which has a 1 in 4 gradient, originally between the Royal Oak and Crown pubs. There is also an individual race for men and another for youths. HOW DID IT START - Tetbury used to be a very important wool town and the origins of the races go back to the 17th century. Some say it was started by young drovers showing off to their girlfriends. WHY STILL DO IT - Its a charity fund-raiser which also includes entertainment and fete with stalls. Founded over a decade ago, the 'Always With A Smile' foundation has grown into one of the most inspiring and successful non-profit goodwill movements in the UK. WHEN - The Wap is held on the Saturday following the first Sunday (which is usually the second Saturday, but not in years when Sunday falls on 1st!) (see What's On Calendar). WHAT HAPPENS - This event is a colourful procession of costumed villages led by the Mop Man who wields a wet mop to clear crowds, from the War Memorial to the Mayor's Pool. The Mayor and Queen are held shoulder high, but this dubious honour culminates in a dunking in the pond for the Mayor who is then washed with spring water. The event finishes with cheese rolling at Well Leaze. HOW DID IT START - There is a tradition claiming it originated 700 years ago when the church was built. The story goes that one of the workmen so enjoyed a liquid supper that his colleagues refreshed him with a visit to the pool. More serious versions link it to priestcraft; or to a Saxon word 'Wappenshaw', when the men gathered to show they were ready for battle. WHY STILL DO IT - Put simply, its great fun and includes music, Morris dancing, stalls, entertainment and refreshments. WHERE - The Cotswold town of Painswick at the Parish Church. WHEN - Feast Sunday, on or after September 19th. WHAT HAPPENS - The church yard is famous for its 99 yew trees and the many attempts to grow the hundredth have never succeeded. 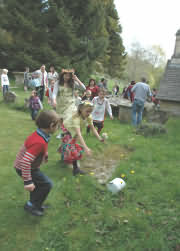 The 'Clypping' comes from the Saxon word 'ycleping' meaning 'embracing' and the ceremony involves local children carrying nosegays (a small bunch of flowers, posy) and joining hands around the church to form an unbroken chain, while singing the Clypping Hymn as part of an open-air service. HOW DID IT START - The custom is thought to date back to 1321 when it formed part of the village fair celebrations. WHY STILL DO IT - It is a Christian service of re-dedication to the church adopted from, more likely than not, the Druids. HISTORY - In ancient times this was a very riotous time with many visitors flooding into the town to view the ceremony, there was a great deal of drunkenness and lewd behaviour, there was also a huge demand for food , local hostelries were very much under pressure and being desperate for meat they made "Puppy Dog" pies, this custom is re-enacted in modern times but with a difference , China Dogs are baked into pies and cakes and sold on the day. Do not say 'BOW WOW' or bark in Painswick. For further information. WHERE - In various places, the most famous being at Cooper's Hill, Brockworth, which is just off the A46 Cheltenham to Stroud road. WHEN - Originally held at Midsummer in June. (See What's On Calendar). This event has been cancelled in 2010 due to Health & Safety issues. WHAT HAPPENS - Competitors sit on the edge of a steep slope, waiting for the guest roller to release a 7lb Double Gloucester cheese on the count of the Master of Ceremonies. They then race down the hill chasing after it - the first person down the hill wins it. The hill in parts approaches a one-in-one gradient guaranteeing a 'topsy-turvy' descent. HOW DID IT START - It is thought to have been started by the Phoenicians, the Ancient Britons, or the Romans. It was certainly an established tradition by the early 1800s. A theory links it to fertility rites. WHY STILL DO IT - For fun and the benefit of the male ego of the contestants, also for charity! Video - Brave runners risked their necks as they chased a rolling cheese down a hill in a traditional contest. The Cheese Rolling at Cooper's Hill in Brockworth, Gloucestershire, is an old custom thought to be part of an old fertility rite celebrating Spring and Summer. The object is to catch the rolling cheese but as it travels as fast as a car the prize is given to whoever reaches the finish line first. The winner of the chase gets to keep the prize of a seven to eight pound Double Gloucester cheese. Randwick is only one of two villages that still enjoy the ancient custom of cheese rolling. In Randwick the cheeses - usually three double Gloucesters are rolled mystically and anticlockwise around the Church after being blessed. The Church service begins at 10.30am on the first Sunday in May. 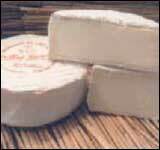 The rolling of the cheeses supposedly wards off evil spirits. After rolling, one of the cheeses is cut up and shared amongst bystanders. Eating of the cheese protects ones' fertility and ensures future generations of "Runickers" - the local name for villagers. The other two cheeses are kept until the following Saturday when they are rolled down the steep slopes of the Well Leaze three times as part of the ancient Wap celebration. For further details see Randwick Wap. WHERE - Dovers Hill, above Chipping Campden with its spectacular views over the Vale of Evesham and towards Stratford-upon-Avon. WHEN - Spring Bank Holiday Monday - 4th June (2004). WHAT HAPPENS - The event starts at 7.30pm and includes a 21st century Robert Dover on horseback attended to by his squire, Endymion Porter. 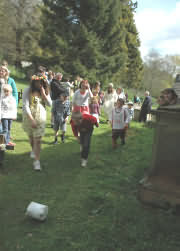 Last year's May Queen is accompanied by a band as she makes her way up the hill to open the proceedings, and the games begin on a lower level - the crowds on top enjoy superb views. Local teams compete in the games , which include welly-wanging, wrestling, shin kicking, and tugs of war. There's also a small fair, bands and refreshments. Just before 10pm the May Queen lights the bonfire, and a firework display follows. Finally the crowds process with flaming torches back to Chipping Campden Square where dancing continues into the night. The following day the new May Queen is crowned at the Scuttlebrook Wake. HOW DID IT START - The games began in 1612, during the reign of James I, due to one man's idiosyncratic vision, Robert Dover, who presided over them on horseback robed in clothes, a hat, a feather and ruff, which originally belonged to the King. WHY STILL DO IT - For the fun of it! The ancient sport of Shin kicking at the Cotswold Olympicks 2016. Competitors battle to knock the other to the floor by kicking their legs away. WHEN AND WHERE - Each year on Whit Sunday the small village of St Briavels, in the Wye Valley, plays host to the Bread and Cheese Dole. This age old tradition sees crowds of medieval-costumed locals converge outside the local Saint Mary's Church in eager anticipation of catching dole pieces of bread and cheese that are thrown into the air from brimming baskets. WHAT HAPPENS - From the moment the first morsels are thrown a thrill of excitement ignites the crowd. Hands outstretched, every man, woman and child battles for his share of the bounty. There are no rules in this battle - women hoist restricting skirts and men pull out extraordinarily large hats to ensure they receive more than their fair share. The Dole has not gone without its fair share of trouble in the past. As far back as 1816 the Gentleman's Magazine recorded that "most of the food was used as pellets; the pastor coming in for his share as he left the pulpit...". The event even had to relocate several times last century - drinking and outbreaks of fighting invariably the cause. HOW DID IT START - The origins of this unusual tradition date back to the time of Milo, Earl of Hereford, in the 12th century, although the first records are from Rudder's account, published in 1779. Dole claimers could be anyone who paid a penny to the Earl of Hereford (then lord of the Forest of Dean) entitling them to gather wood from nearby Hucknoll's woods. Although the tradition of being able to gather wood has disappeared, the Dole lives on. Revelers believe in the power of these edible morsels and preserve them for good luck (miners originally used them as charms to protect against accidents). Today some people choose to place them in matchboxes and rest them under their pillow to inspire dreams of the future. The town crier leads a procession of characters (Mummers) dressed in paper costumes through the streets of Marshfield - a village in the south of Gloucestershire. Beginning at Marshfield Market Place at about eleven o'clock and working their way down to a pitch outside the Elias Crispe almshouses, the 'paper boys' perform the town's unique mumming play. This performance is preceded by the singing of carols to the large audience. They then perform a further three times along the main street, and then return to the Lord Nelson public house where they perform again. After a brief break, they actually performed for a sixth time along the road - this is more an informal performance with some of the reserve mummers taking the parts and some ad libbing. By noon, the whole thing is finished. Several hundred people watch the first performance, but the audiences drop off after each performance. The village of Marshfield is near Chippenham in South Gloucestershire.